Tall, leggy and beyond beautiful, delphiniums already reign as the supermodels of the garden. So how could they get any better? That’s right, gardeners tend to be intimidated by the statuesque bearing of the delphinium’s spires. Never mind that the petals look as if they’re made from the finest velvet or that the range of colors could rival the wardrobe of Cindy Crawford. At 6 to 9 feet, delphiniums are just too tall for most gardeners who are making do with less space than prior generations. So, with the proper amount of pomp and circumstance, Log House Plants in Cottage Grove is about to roll out the world’s first dwarf delphiniums under the name ‘New Heights.’ Bred in Holland from the hardy English delphiniums, the new strain will hit retail stores this spring. The new dwarf varieties, which grow from 3 to 4 feet, are more resilient and less in need of staking. Best of all, they produce the uniform flower spikes and the extraordinary range of colors, eyes and bees that the English delphiniums are known for. This particular story starts back in 1994 when Doyle was turned on to English delphiniums by Portland gardener Chuck Smith, who’d seen an article. Until then, this old and very strong strain had been limited to Great Britain because they’re propagated by crown cuttings rather than seed, and crowns could not be exported. But amateur breeders in Britain had been painstakingly hand-pollinating their delphiniums and were more than ready to help Doyle show the world what it was missing. Even though seed can only be collected from the first year of a cross in order to maintain the plant’s vigor, Doyle was able to get hold of 700,000 of the handcrossed seed. By 1996, Log House was growing and supplying English delphiniums to nurseries throughout the Northwest, and gardeners were eating them up. 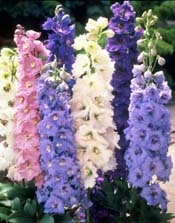 “English delphiniums are a good seller, most definitely,” says Mariah Steenson of Portland Nursery. Which bodes well for the ‘New Heights’ dwarfs, which better fit the scale of a smaller plot. It’s taken some time and a surge of interest from other countries, but gardeners are finally getting what they want. Both New Zealand and Holland have jumped on the bandwagon in the last several years, breeding new strains from the English delphiniums. From New Zealand comes the ‘New Millennium’ series, developed for heat and humidity tolerance. The Dutch-bred ‘Centurion’ series offers even bigger spikes with more florets and deeper colors. The first dwarf was spotted in Holland about five years ago in a field of English delphiniums being grown for cut flowers. A naturally occurring sport that looked like a sumo wrestler dressed for an Easter party grabbed the attention of a Dutch hybridizer, who began handcrossing it to named varieties to come up with a whole new strain. “It had the same strength of cane, that thickness that’s so important. And the same huge florets . . . like a miniature version of the 7-foot English delphiniums they had growing in the field,” Doyle says. Fortunately she knew the hybridizer and was able to convince him into giving Log House the world exclusive. As a bonus, Log House got to name the new series. So now the supermodels of the garden have new runway competition. Isn’t variety nice? Kym Pokorny can be reached at 503-221-8205 or by e-mail at kympokorny@news.oregonian.com.